David’s Fort: a Medieval Motte? 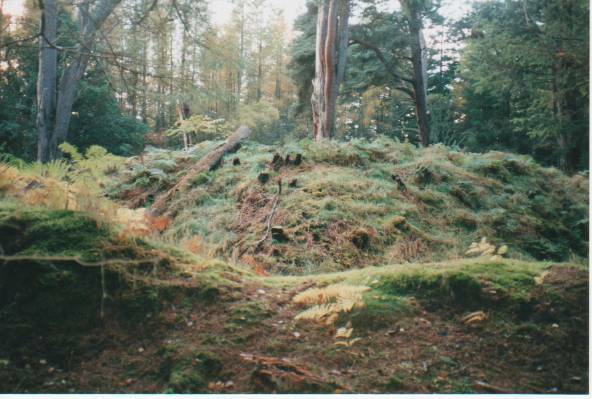 In around 2000 Janet Hooper, Allan MacKenzie and I undertook a survey of David’s Fort, a rather enigmatic site in Balavil Wood, near Conon Bridge. Our intention was to survey the site, clarify its purpose and investigate the related documentary and contextual information. We did arrange a geophysical survey which was cancelled due to Foot and Mouth, and that was replaced with a later walkover of Balavil Wood. David’s Fort itself is scheduled, but there are other features in the immediate area which may be related and which are worthy of notice. David’s Fort (NH5394 5328; HER MHG8986) is essentially a large earth mound surrounded by a ditch, surrounded by an embankment. The mound and embankment were created by digging out the ditch. It’s trapezoidal in shape, and the top of the mound measures approximately 80 x 85 feet. The moat is around 15 feet deep and is partially filled with water. 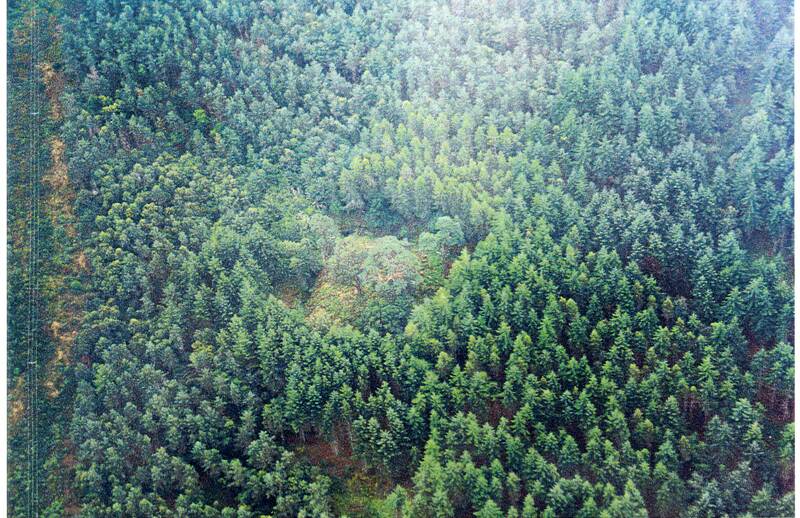 There’s no sign of any structures on the top of the mound, but these would probably have been wooden and evidence would not have survived the trees and bracken which have invaded the site. There is a dip on the west end and a corresponding dip in the embankment with a track running down to the mediaeval road which runs from Tarradale on the Beauly Firth to the ford over the River Conon. It’s been assumed that this is where the entrance was, though, since the embankment is considerably lower than the top of the mound, any bridge would either be very sloped, or mounted on a framework which raises the question “why the dip in the embankment and the very obvious path leading from that dip?” The embankment surrounding the mound has been extended for a short distance at three of the corners. The purpose of this is not clear. Water was fed into the moat via a channel leading from a lochan to the east of the site and controlled by a sluice but this channel has been damaged by the embankment which carries the power lines. This entry was posted in General Archaeology, Medieval, Strathconon and Ross-shire, Surveying and Recording and tagged Allanfearn monastery, Balavil Wood, Bishop Kinkell, Borgie Bridge, Conan House, Conan Mains Farm, Conon Bridge archaeology, david's fort, Dingwall Castle, Easter Ross archaeology, homestead moat, Logiebride Churchyard, medieval archaeology, moated site, motte, North of Scotland Archaeological Society, NOSAS, NOSAS report, Proncy Castle, RCAHMS, recording and surveying, Tigh Diabdh, trapezoidal structure on February 22, 2016 by nosas.